knowingly sponsored, endorsed, and forever immortalized these butchers into history. "Pioneers and Prominent Men of Utah." 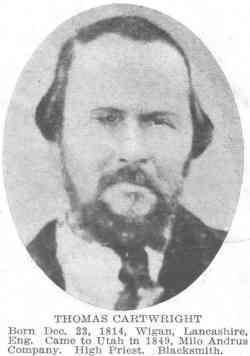 THOMAS HENRY CARTWRIGHT, a MORMON SHOOTER & CLUBBER, and a pvt. in the Iron County Militia; (son of William Cartwright and Charlotte Hood of Church Gresley, Derbyshire, Eng ) Born: 23, December, 1814, Wigan, Lancashire, England. Married Ann Hardwick Jan 30, 1859, at Burton-on-Trent, Derbyshire, Eng (daughter of John Hardwick and Ann Sandlant of Woodville, Derbyshire, Eng) They came to Utah Sept 4, 1859 with George Rowley handcart company She was born Aug 6, 1837. Their children John William died at 16 months, Thos H, m Elizabeth Smith, Edith H, m J G McDonald, John A, m Nellie Liddle, Annie E, m Charles F Solomon, Myrtle, m William Murdock Family home Salt Lake City. Missionary to England 1883. Missionary to England 1883 to 1885, priest of 10th quorum of seventies, superintendent of Sunday school, bishop's counselor. Manufacturer of crockery, merchant. He was a Mormon High Priest and his occupation was a blacksmith. Information on the above Mormon Shooter and Clubber, was obtained from the following: Pioneers and Prominent Men of Utah, The 1857 Iron County Militia Project, Mountain Meadows Massacre Assassins, Lee and Shirts. To find the genealogy on the above Shooter and Cluber click here.